You might want to jumpstart your Bible journaling journey but have no idea where to start. These 6 examples will give you ideas that are easy to implement. Whenever I am clueless about how to illustrate a verse that spoke to my heart, I head over to Pinterest and type ‘Bible Journaling’ into the search bar. What I like about this is that the creativity of others gives me ideas that I would never have thought of in a million years. I might ‘borrow’ an idea from several pins and by the time I’m done, it isn’t at all the same. That is why I am going to share 6 examples of my artwork. I hope that this will give you some ideas to go with your own verse. It is from examples of journaling art that I have learned how to draw again. 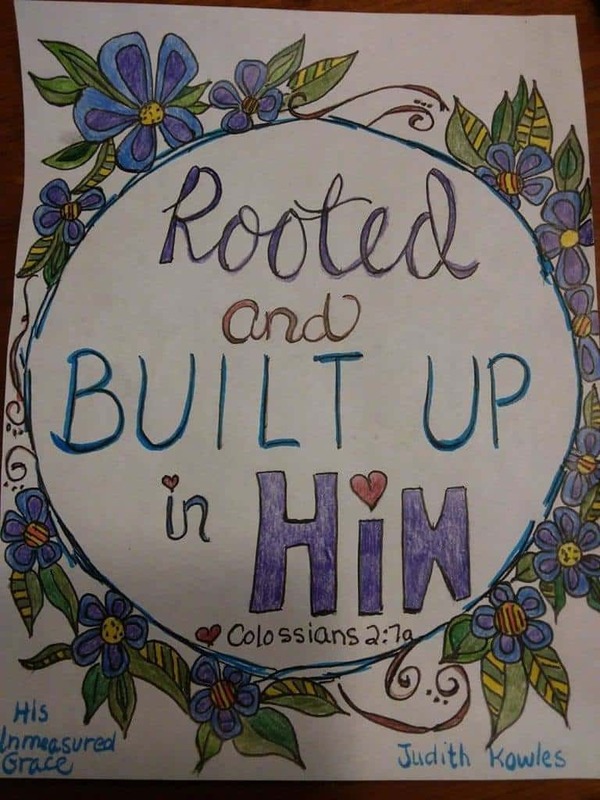 Illustrating in my Bible about a verse that God impressed on my heart has helped me to draw closer to the Lord. So often it is through the example of others that we are encouraged to step up to a higher level. If I can help you reach the next rung of your faith-ladder by pointing you to Jesus and becoming a creative for His glory, I will be so grateful! This is a fairly easy design to create. The fonts in the lettering that I used is none other than my own. It has taken me a long time to start getting the hang of how to draw scrolls. They off-set a word in the illustration. To be honest, I am sure that I traced the scroll. The flower and the butterfly were copied from a coloring book. I don’t always trace them but if you don’t feel that you have one ounce of artistic ability in you, then TRACE them! 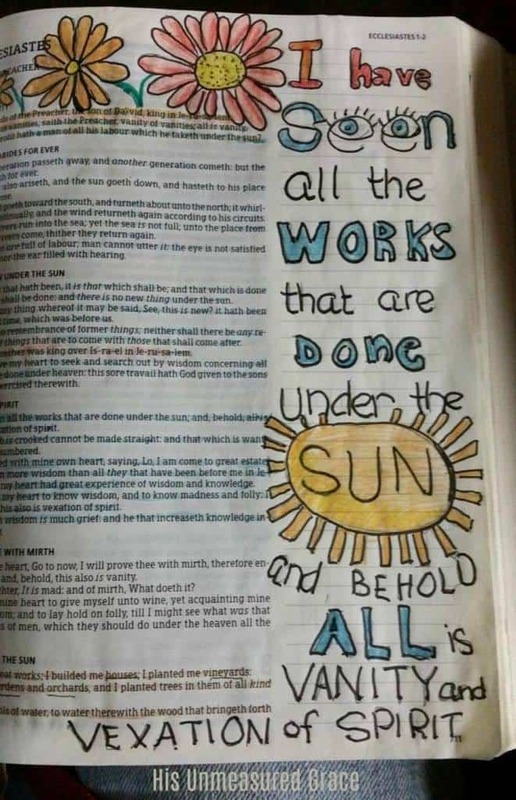 You don’t have to draw in your Bible! This is done in an artist notebook. If you use one of these you will be able to frame it for decoration in your home! This is adapted from a book about journaling art. The design is similar but the quote is a Bible verse instead of a general quote about life. This is a simple drawing with a cross and some flowers. I think that I should get a 6″ ruler so my lines would be straight! The flowers are so simple. You can find similar ones on Pinterest or in a Coloring book. The lettering is really my own style with some flourishes that I have seen on Pinterest. You want to keep your work uncomplicated because if it takes you a couple of hours, you’ll not draw often! This one was very simple to do with daisies and a sun. The letters were easy too and just shows how you CAN DO THIS with your own handwriting. I think you will benefit from starting with your own handwriting with simple things to draw or trace. Later when you have more confidence you can start learning some of the more creative fonts. I often use a Micron Pen to make the outline over my penciled rough-draft but I sometimes choose colored pencil crayons. This just shows what you can do with something as simple as a flower. These aren’t complicated as you can see. The point I want you to see is that Bible journaling art doesn’t have to be about how beautiful you can draw and do lettering. Getting started without being held back by perfection is the best way to jumpstart your desire to become artistic. 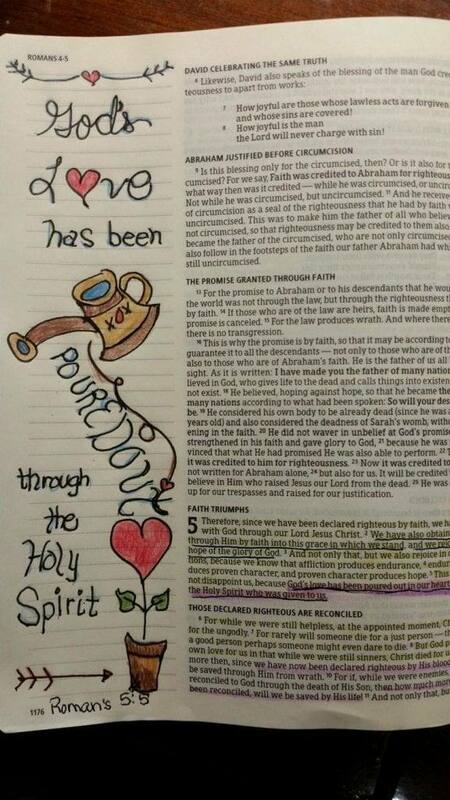 I love this illustration of Romans 5:5 because of the simplicity of the artistic elements and embellishments. I want nothing to hold you back from getting started with your Bible journaling journey. That’s why I want to give you a jumpstart by showing you that it really isn’t intimidating at all. Bible journaling is really about worshiping your Lord and Savior, Jesus Christ and not about how beautiful your work is. If you remember one thing from this Bible journaling workshop, I hope it is that illustrating in your Bible is all about drawing closer to Jesus. It is time spent alone with God in such a way that you slow your pace and pause long enough to hear His voice speaking to you. Are you new to Bible journaling art? What was one takeaway that will give you a jumpstart to worshiping God through creative journaling?